There are many recipes for this popular tea-time treat. 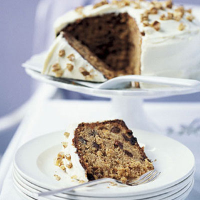 Our version is mildly spiced with fresh ginger and has a light and creamy mascarpone frosting. Preheat the oven to 180°C, gas mark 4. Grease a 20cm round, deep cake tin and line with baking parchment. Coarsely grate the carrots and remove any excess moisture by patting between several layers of kitchen paper. Peel and finely grate the ginger into a small dish to catch all the juice. Squeeze the ginger against the side of the dish to release more juice. Reserve the juice, and put the grated ginger in a large bowl with the butter, sugar and orange zest. Beat with an electric hand whisk until pale and fluffy. Add the eggs, a little at a time, beating well after each addition. (If the mixture curdles, beat in a little of the flour). Sift the flour, baking powder and allspice into the bowl. Add the almonds, grated carrots, raisins and 75g of the walnuts, and stir gently together until evenly combined. Spoon into the tin, level the surface and bake for about 1-1¼ hours until risen and golden. To test the cake is cooked, push a skewer into the centre - it should come out clean. If necessary, bake for a little longer. Remove the cooked cake from the tin and leave to cool on a wire rack. To make the frosting, beat the mascarpone in a bowl. Add the ginger juice, orange juice and icing sugar, and beat until smooth. Using a palette knife, spread the frosting over the top and sides of the cake. Scatter with the walnuts. Keep in a cool place until ready to serve at room temperature. Cover any leftover cake and store in the fridge. This recipe was first published in Wed Mar 01 00:00:00 GMT 2006.